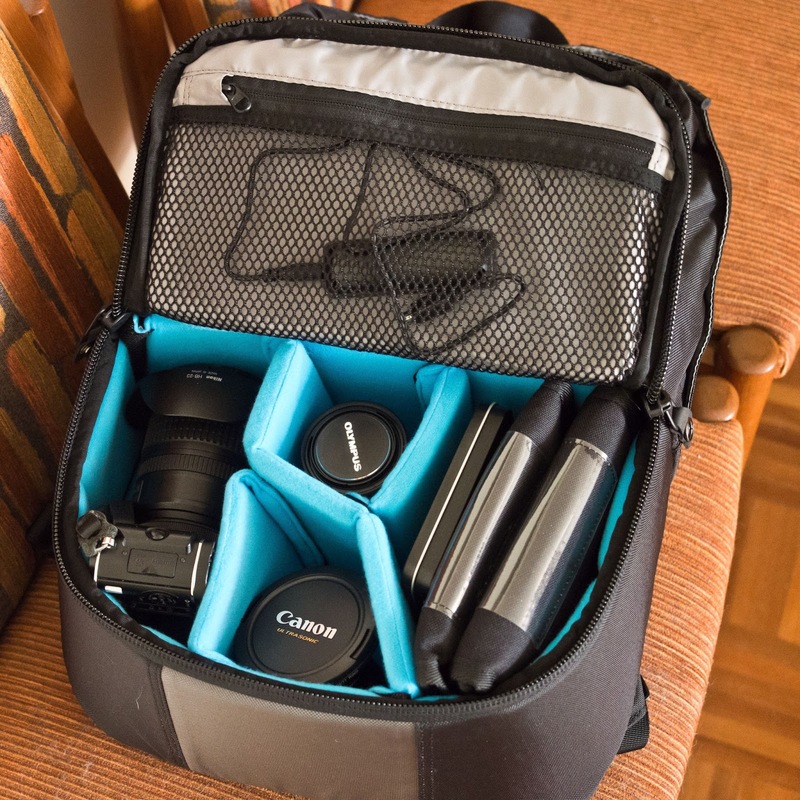 I have been looking for a new camera backpack that is airline friendly. The problem I have is that my regional airline only allows quite small cabin bags and I am heading off on an overseas trip soon that allows large bags but only with quite skinny dimensions!!! The last bag I bought for travel does not comply with the current cabin bag limits. 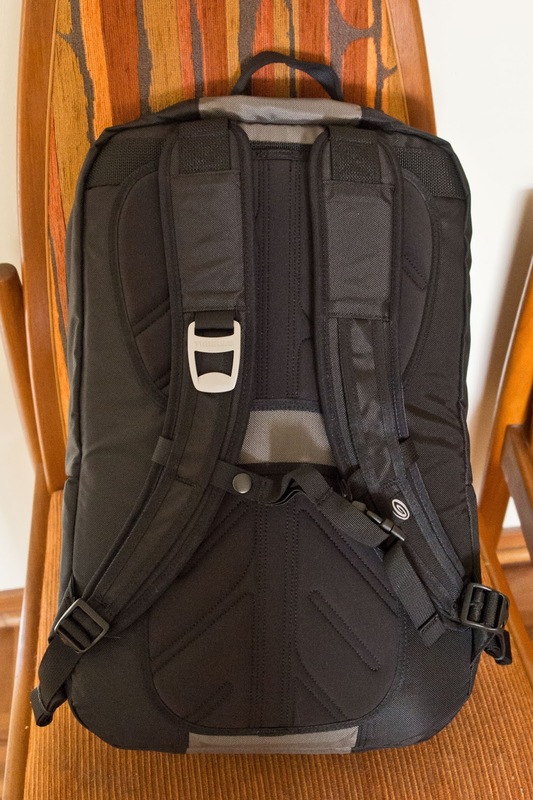 As well as my camera gear, I want the backpack to serve as a day pack for hiking. I looked at many options taking into account the gear I want to take and all were compromises. 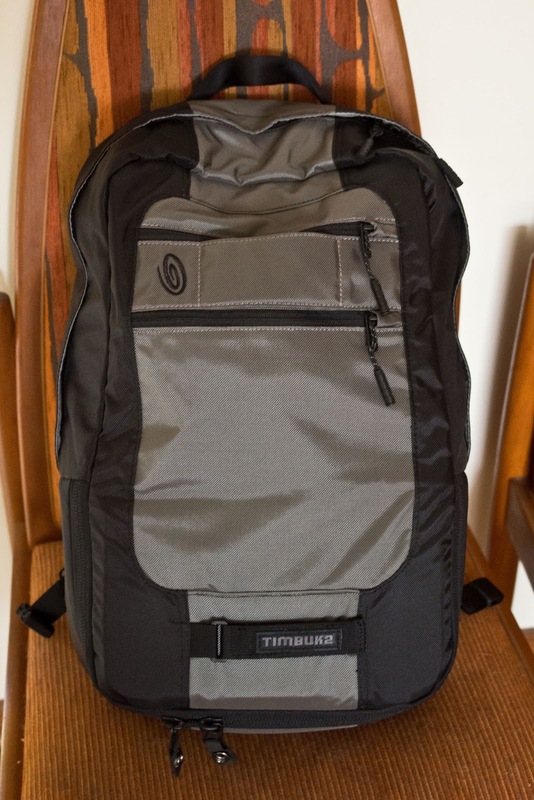 The best fit (at a reasonable price) was the Timbuk2 Camera Sleuth Backpack. With B & H having the black/grey version on sale, I could pick up the backpack, the optional rain cover and a couple of camera accessories for little more than half the price of the bag from an Australian seller. I thought I would give B & H a go and test out there new low postage rates to Australia. The bag seems very well made and has a quality feel about it. It doesn’t have that “I am a camera bag” look which is a plus. The outside of the bag is very simple. Two small zippered pockets, provision for holding a tripod, a sternum strap to help keep the shoulder pads in place and other than the zippers for the top and bottom section, that’s about it. Oh, I forgot, a bottle opener that seems to be a Timbuk2 trademark. There is a convenient carry loop at the top and the top section zipper has a flap for rain protection. A bit more than half the bag is devoted to the general storage area which is fine for me. There is a dedicated camera sleeve and some storage pockets in the top. Very generous padding ensures everything is well protected. 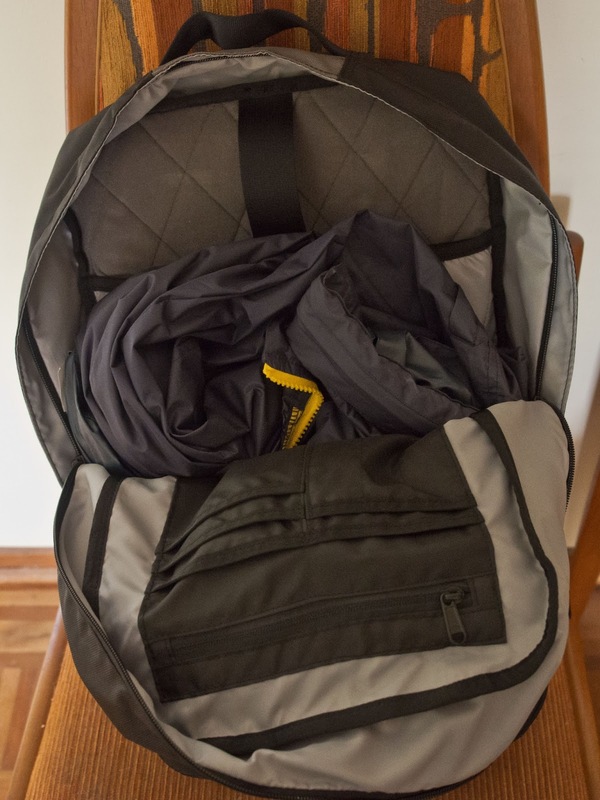 The top section has a waterproof jacket, battery, rain cover (not a standard inclusion of the backpack) and 13.3” laptop in the very well-padded sleeve. The bottom camera section has a double zipper that opens to the bottom which means you need to take the backpack off to use. The zipper has a very stiff press-stud to offer some time delay for would be thieves. The bottom section contains a single z-shaped divider and two small secondary dividers to split up the space. I think there should be one more. In addition, the divider between the top section and camera section can be removed. It is quite secure with Velcro on all sides. The Velcro holds well but the camera section dividers do seem far too thick and too high while the z-shaped divider could be a little longer. The previous picture shows an Olympus E-P3 with Metabones Speed Booster and Nikon 10-24mm f/3.5-4.5 lens attached (complete with hood), Olympus 60mm f/2.8 macro and SLR Magic 12mm T1.6 lens. Also in there is a Lee filter holder, 3 x 150x100 filters, a Little Stopper and remote control. There is a little bit of free space but the dividers make it difficult to optimise the use. It is quite difficult to use the space well when you have a reasonably long lens combination, e.g. the Olympus OM-D E-M5 and 40-150mm f/2.8 Pro lens combination. 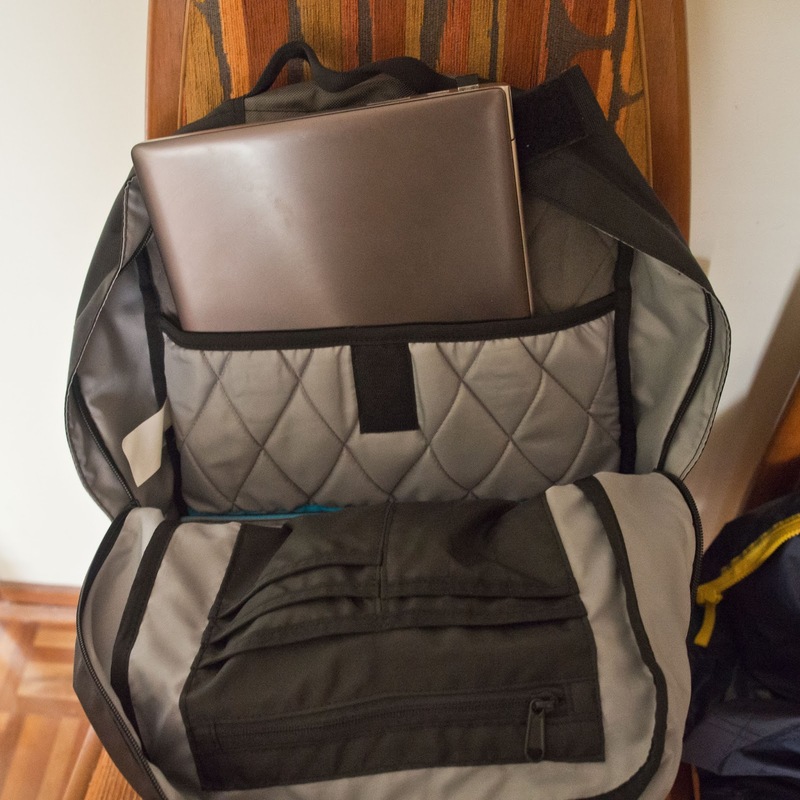 The backpack itself is reasonably comfortable without the laptop but as with most backpacks that place the laptop against your back, less so when the laptop is included. The straps could have a bit more padding and I find the sternum strap, while adjustable, isn’t ideally placed. The back has foam padding but as it lacks mesh, I would expect it not to be ideal for long hikes in summer. The bag is well made and offers heaps of protection. It is also small aircraft cabin friendly. Great value for money. This would also make a really great urban walkabout bag. The excellent padding and so-so partition design makes it hard to optimise the space in the camera section and as a consequence of the extra padding, a little heavy for its size. There are no drinks pockets and the tripod storage means you cannot use the small external pockets when you have a tripod attached. Rain cover is an expensive option. Good value for money and quite suitable for a walk around town or taking gear on aircraft. Not ideal for hiking or if you have bulky gear.